Teknasiums are computer-based, technology enrichment and training centers that provide STEM Learning Experiences through hands-on, knowledge-based projects guided by highly skilled facilitators. 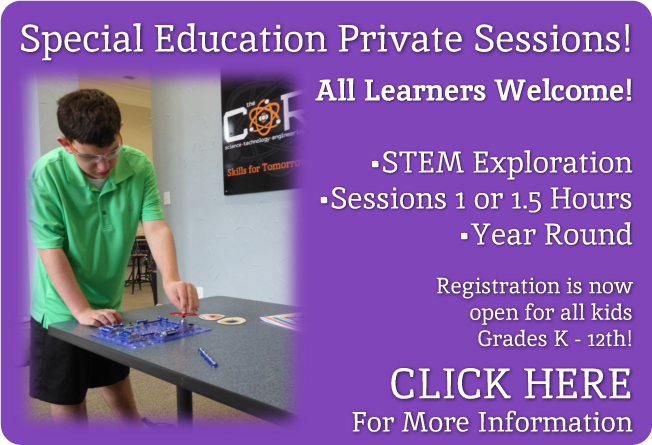 the CORE™ is the only dedicated STEM (Science, Technology, Engineering, Math) enrichment center in Rockwall, TX. We provide highly qualified facilitators to guide Kindergarten - 12th Graders through more than 300 STEM projects, preparing them for the careers of tomorrow. the CORE™ is computer and project-based STEM Learning Environment, a Teknasium (gymnasium for the brain!). Open 6 days a week for both 1hr/30min and 1hr sessions, the CORE™ exists to facilitate the practical learning and application of cross-cutting technology concepts, helping to develop higher level learning and problem solving skills. Registration is always open. Please stop by for a tour! Our Fall and Spring schedules include regular lab sessions, with camps during school breaks. Then our Summer schedule includes weekly camp opportunities and a somewhat modified regular lab schedule. Summer camps will be posted under the Summer Camps tab by March of each year. Check out the FUN, grab your friends, sign up and pay online. Feel free to contact us with your questions – we’d love to hear from you! Are you interested in learning more about how the CORE™ can help meet your child’s needs and interests in this increasingly tech-driven world? Drop in for a tour! Come ride this amazing STEM tidal wave with us at the CORE™! If you would like to become a member, please print, fill out, and bring in these forms before the first session. If it is easier to email, then you may scan and email the completed documents to carolyn@speroacademics.com. We also have these forms in our office if you would rather come to our facility to fill them out. Thank you and we look forward to having you as a member. You can make a tax-deductible donation to sponsor Boys & Girl's Club sessions and foster kids. When you are ready, you can make a payment through Authorize.net at any time. Please contact us to setup recurring payments. Please write in the amount to cover your member fee(s). If your payment is a gift, please tell us for whom in the note section as you complete your purchase. A strong team of highly qualified and experienced professionals plan daily for success. These individuals are the backbone of all we do at the CORE™.